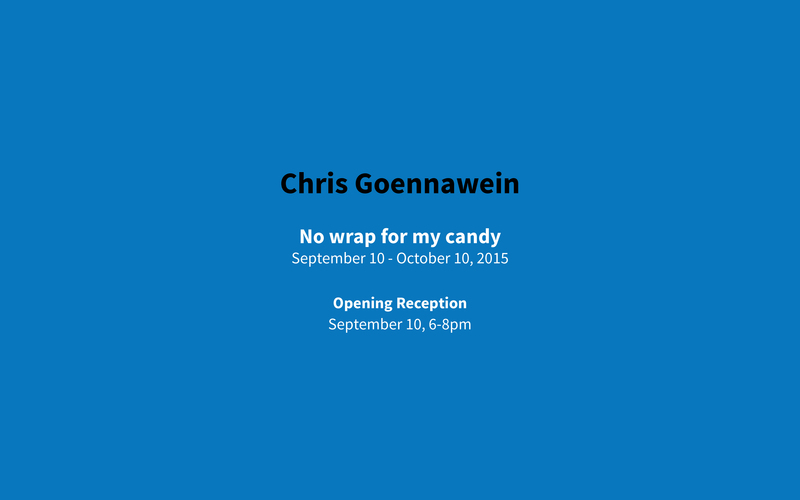 c. nichols project is pleased to present No wrap for my candy, the first Los Angeles solo exhibition of Chris Goennawein. Born in Heidelberg, Germany, in 1979, he currently lives and works in Munich. Goennawein’s work is tied to the concept of the physical and narrative development of the interpretation of images over planes in space and in time. The theoretical and interpretive framing of the formal characteristics of his work is of importance in equal measure to the physical frame through which they are viewed. For this reason, with No wrap for my candy, Goennawein will present a set of unframed acrylic paintings on aluminum panels and a series of drawings. An artists’ publication will accompany these works in the exhibition. Visual wordplay is an essential function of his work. Borrowing from the journalistic “iceberg theory” of Ernest Hemmingway Goennawein represents the visual language of found items that have not yet been lost. Whereas facts float above water, the symbolic texture of meaning rests below, and it is within this space that Goennawein attempts to tell his truths in their most “pure” form. Exploring the meanings of “structures” in mathematics and art through his use of vectors, his creative process is to identify the characteristics of form more so than the form itself. In other works he is interested in “work that is not involving the immediate experience of 'real world.'" Utilizing the same type of acrylic paint as is implemented in traditional mechanical printing methods, Goennawein overlays additional layers of acrylic on their surface by hand, and in doing so he questions the visual and linguistic syntax within the era of digital reproduction. Strong conceptual parallels exist between his work and the visual semantics of “Pictures Generation” artists such as Sarah Charlsworth, and John Baldessari. Or the of Giorgio Agamben’s questioning of the classic Aristotelian logic wherein “the problem becomes that of the interminable search for an ultimate, irreducible element, beyond which it is not possible to proceed.” Linguistically, the works harken to Ferdinand Saussure’s understanding of the process of signification: the sign is the whole that results from the association of the signifier with the signified in its material patterns. Anchors of the exhibition are Goennaweins’ lacquered acrylic hexagonal polygons. These sculptures mirror irreducible elements and are often found repetitiously in many “architectonic” structures of nature: the epithelial cells of an eye, honeycombs, or snowflakes. The hexagon represents elements in their most stable, and measurably observable (or countable), form.